The purpose of the machine, and the various versions of it, is to excavate, macerate and spread turf for the production of sod peat. This is necessary as the high spread ground area diminishes to the point where it will not take a full spread. The machine consists of a sturdy main frame, supported on power driven caterpillar tracks, which carries the various units and their transmission drives and to which is attached a spreader arm. The turf is excavated by a multi-bucket type digger boom which is retractable to facilitate operation at varying depths, and is pivoted on the main machine so that it can be stowed for idle travel. The boom cuts a face bank at 600 to the horizontal. The turf is discharged from boom buckets into a scraper conveyor, and in turn, into a screw conveyor and twin screw macerator. The macerator extrudes the turf onto the spreader plate chain which carries the extrusion for a distance of 54 metres, when it is discharged to the bog surface. Cutting discs trailing behind the spreader arm, marks the extrusion into sods as the machine advances. The machine is powered by electricity, and friction clutches are fitted to all motor drives for starting up. All unit drives are protected by shear pins. The machine is fitted with lights for night work and equipped with a short wave radio transmitting /receiving set. This machine was built mainly from existing equipment. The main machine of a type 6 or mitre boom excavator with digger boom, screw conveyor and conveyor belt only, is used on the high bog. 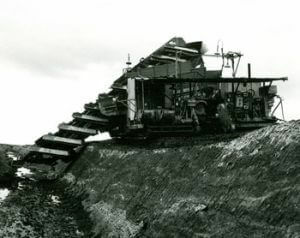 The remaining equipment, namely, premixer screw conveyor, macerator and spreader unit together with driving motors, was transferred to a suitably tracked main frame which is positioned in the cutaway adjacent to the uncut bank. A belt conveyor of light lattice construction framework connects the two machines. The high level machine operates as described for the type 5 excavator but discharges the turf from the conveyor belt onto the interconnecting conveyor belt which in turn discharges into a hopper constructed over the premixing screw on the low level machine. The interconnecting conveyor is free to pivot on the high level machine and is also free to pivot and move relative to the low machine so that steering of the machines is not critical. The movement relative to the lower machine is, however, controlled by winch rope to assist steering the high level machine. For idle travel the interconnecting conveyor is released from the high level machine and retracted and stowed on the low level machine. This allows the machines to move independently. When working, one power supply cable is used for the two machines. When in idle travel, separate power supply cables are used. The specification for the various units are as for the type 5 excavator. The machine is fitted with lights for night work and equipped with a short wave radio transmitting/ receiving set. 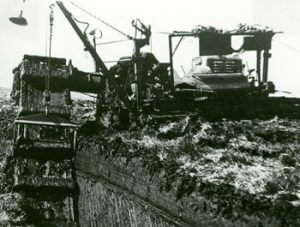 This machine works on the high bog, cutting a bank at 45 0 to the horizontal, while the bottom of the cut is horizontal. The machine consists of a sturdy main frame built on two caterpillar type tracks, carrying a multi-bucket excavator boom, a scraper conveyor, a screw conveyor, macerator and spreader unit. The tracks of the main machine are power driven, some machines are equipped with mechanical variable speed drives from electric motors, while others have variable speed electric motor drives. The boom is of special design in respect of the bucket motions relative to the boom chains, and the mounting of the drive and idler sprockets, to achieve the 45 0 parallelogram section of cut. The motor driving the boom is carried within its framework and is coupled by universal shaft to a worm reduction gearbox at the top of the boom. The sequence of operation is the same as for the Type 6 Excavator. The machine is fitted with lights for night working, and is equipped with short wave radio transmitting/ receiving set. The machine has a main frame, supported on power driven caterpillar tracks and steering is effected by coil clutch and brake arrangement. A multi-bucket digger boom at one side of the machine is inclined at 45 0 when in the working position, the forward side of the buckets cutting as the machine advances. The buckets discharge the turf by the rear, as they pass over the top sprockets, into a combined screw conveyor and macerator unit, which extrudes it through a single orifice nozzle onto the spreader plate chain. The spreader arm carrying the plate chain extends out over the spread ground and is supported by wire ropes suspended from an overhung mast from the machine. As the extrusion of turf is carried away from the macerator nozzle on the plate chain, a power driven device marks it into sod lengths. The marked extrusion is discharged onto the spread ground by a timed trip rail, in 22 metre lengths. For idle travel, the boom supported on the machine by a frame, pin jointed on the top shaft centre and on the main frame of the machine, can be retracted over the machine by hydraulics and winch rope. The machine is powered by a diesel engine. The machine consists of a main frame supported on power driven caterpillar type tracks, carrying a digger boom, screw conveyor, belt conveyor, premixing screw conveyor, twin screw macerator and spreader unit. The digger boom is carried on the side of the machine on a pivot cradle and cuts a face bank of 60 0 to the horizontal. It can be raised and lowered by power winch to suit varying depths of cut and for idle travel can be pivoted back over the main machine. The turf is cut and lifted by the buckets and discharged, as they turn over the boom top, into a screw conveyor, and in turn onto a rubber canvas conveyor belt, premixer screw conveyor and the twin screw macerator unit. The macerator extrudes the turf through a twin orifice spout onto the spreader plate chain which carries it out and discharges it in 54 metre lengths on the spread ground. Steel discs trailed behind the spreader cut the extrusion into sod lengths. The machine is powered by electricity, illuminated for night work and is equipped with a short wave radio transmitting/receiving set for communication with workshops and other similarly equipped machines. 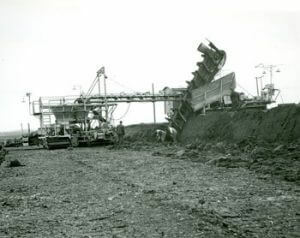 This machine, designed to work on the cutaway level of the bog, is supported on generous caterpillar type tracks. The trailing type bucket boom at one side of the machine is carried by the screw conveyor casing which is cantilevered from the main machine at a high level, and projects into the boom structure. The boom pivots about this support point. The trailing bottom of the boom is lifted and lowered hydraulically to vary the depth of cut. The boom cuts a face bank at 80 0 to the horizontal. The turf is carried up and over the top of the boom and discharged through a bar screen into the screw conveyor. 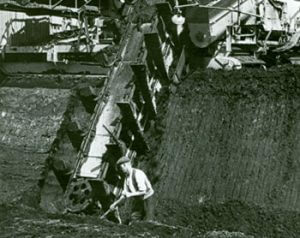 The screw conveyor passes the turf onto a scraper conveyor and in turn into a hopper over the macerator. The macerator extrudes the turf through a twin orifice nozzle onto the plate chain of the spreader unit. The extrusions are extended 54 metres on the plate chain when they are discharged to the spreadground. Trailing discs mark the extrusion into sod lengths. The boom, screw conveyor, scraper conveyor, macerator and spreader plate chain are all driven from one electric motor fitted with a hydraulic coupling and star-delta control gear. The hydraulic coupling obviates the necessity for friction clutches on the various transmissions for starting. The main machine tracks and spreader tracks are powered by variable speed electric motors, remotely controlled from the cab. The spreader track drive is transmitted from the variable speed electric motor through a reduction gearbox, wire rope drive to a two speed gearbox located between each pair of spreader tracks. This drive gives very smooth forward travel. The machine is fitted with lights for night work and equipped with a short wave radio transmitting / receiving set. The machine is used in the initial working of bogs to expedite drainage and prepare face banks for the larger machines. It is also used as a permanent production unit on the smaller bogs where the larger machine would be uneconomical. 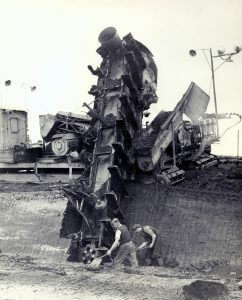 The machine consists of a lightly constructed main frame, supported on two caterpillar type power driven tracks; a light multi-bucket trailing type digger boom supported and pivoted at the top end, on the casing of the screw conveyor which projects from the main machine; a macerator unit, which is actually a continuation of the screw conveyor, is single screw type with rotating chopper knives working between fixed knives; a light box section spreader arm supported on one caterpillar type track and braced to the machine with wire ropes. The depth of cut is controlled by power driven winch rope on which the lower end of the digger boom is suspended. The outlet of the macerator has a single orifice spout extruding the turf onto the spreader plate chain. Cutting discs are trailed behind the spreader to mark the extrusion into sod lengths as it lies on the spread ground. The machine is powered by a diesel engine, and is steered by coil clutch and brakes on the track drive. The spreader track is power driven by wire pull rope and ratchet arrangement with speed adjustment.